Smart cards that use biometrics are now available. 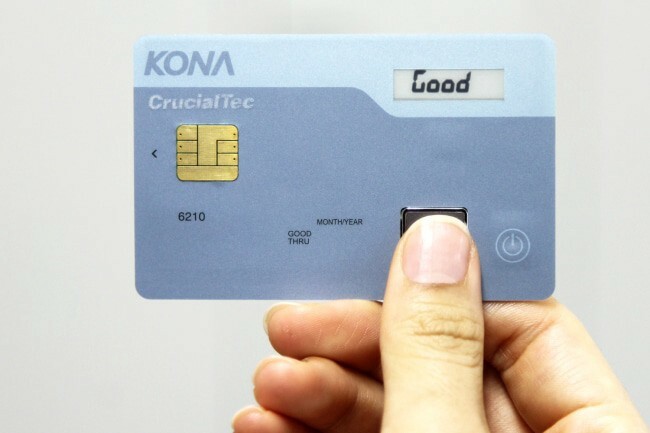 More, the card can be used with the process detailed below to encrypt files securely (see also the last post) and to even authenticate to a computer and secure a VPN to a remote system. Data encryption on personal devices such as laptops or PCs is intended to protect the hard disk data in the event that the device is lost or stolen. Existing methods suffer from a variety of drawbacks. For example, to decrypt the hard disk, the user might need to enter a secret such as a PIN or passphrase. But short codes such as the typically 4–8-long-character PINs can easily be broken by a hacker who has physical possession of the device and plenty of time to try common combinations. Passphrases are much more secure, but these depend on the user memorising a lengthy set of code words or a long sentence. A much more secure process involves the use of a cryptographic key, for instance by plugging in a USB drive. Even such a method, though, has security vulnerabilities. Despite the direct physical connection between the USB drive and the device, the transmitted secret can still be intercepted due to the electromagnetic signals generated during transmission (e.g. via power analysis) . The present method overcomes problems of such nature by enabling the personal device to calculate the secret based on transmission of only non-secret information by an authenticated user. The Software — when capitalised, ‘Software’ refers to the application running on the PED that performs the elliptic-curve calculations and communicates with the Keyring. The App — when capitalised, ‘App’ refers to the application running on the Keyring that performs the elliptic-curve calculations and communicates with the PED. Session — The period of time when the PED is unencrypted and in use by the User. A session begins with User Authentication, followed by PED Decryption, and ends with PED Encryption. 1. The encryption/decryption key is a full-strength cryptographic key (e.g. AES256) that is itself never passed between user and device. Instead, the key is recalculated when needed after authenticating the User’s Keyring. The encryption key is used for only one encryption/decryption cycle. A new key is calculated for each cycle. 2. 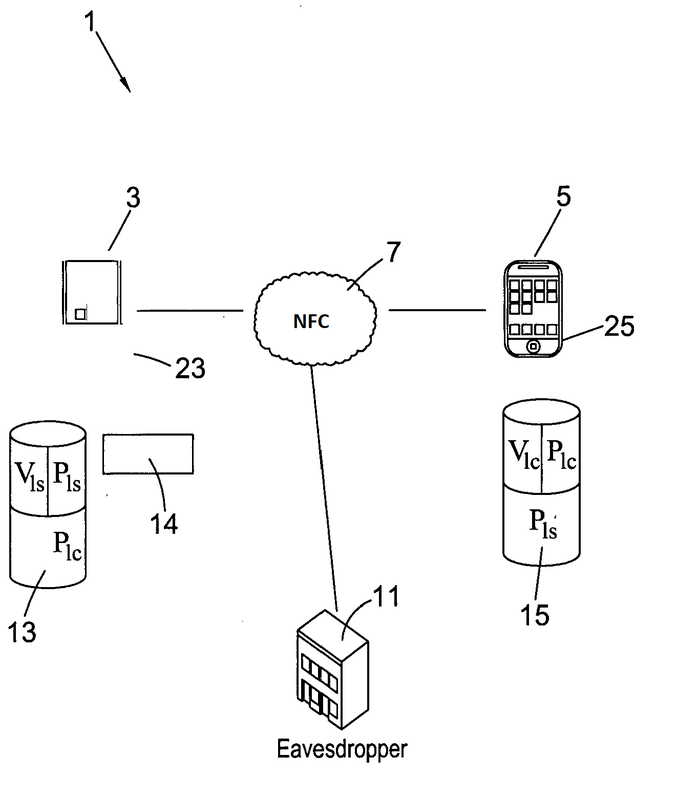 The method uses the secret-key sharing protocol described in nChains patent ‘Determining a common secret for two nodes’ (henceforth abbreviated to DCS —’ Determining a Common Secret’). 1. The actual encryption/decryption process employs existing standards and is not described here. 2. Protocols for handling interruptions to the communications (e.g. disconnected cable) are not described here. The description is by way of an example assuming that the PED is a laptop running the Software and the Keyring is a smartphone running the App. The initialisation phase begins with a fully unencrypted laptop onto which the Software has been downloaded and installed (into a partition that will remain unencrypted). The compatible smartphone-App version of the Software has been installed on the smartphone — by ‘compatible’ meaning the same ECC standard (for example secp256k1) with a common set of parameters including the generator G is used on both devices, and the software on each device uses a common protocol as described herein. The ECC parameters are permanently stored on each device (these need not be kept secure). 1) The laptop and smartphone are connected. The connection is made either by a cable or by a wireless protocol such as Bluetooth. The laptop Software establishes contact with the smartphone App, and verifies by exchange of appropriate signals that the Software versions are compatible and in sync. a. Note: all existing security measures are assumed to be in effect. I.e, the smartphone has been unlocked by the user’s security code, and the user has logged into the laptop with the password in the usual way. 2) The laptop Software and the smartphone App both independently generate their own public/private key pairs based on G. The initial generation of keys are the master keys. The private keys (VMS and VMC) are each kept secure on the relevant owning device. The public keys (PMS and PMC) are each transmitted to the other device. Each device permanently saves the three master keys (their own private/public keys + other device’s public key). Initialisation continues through to the end of the first Encryption phase. From then on, each session is composed of a decryption phase at the beginning and an encryption phase at the end. (Note: the App could also calculate the secret, as in DCS, but in the present invention only the Software is required to derive the value). 7) As part of the log-off and shut-down processes, the Software encrypts the disk. The Encryption key E is not stored anywhere, and the message Mn is not stored on the laptop. The message Mn is securely stored on the smartphone for use in the next session to decrypt the hard drive. 8) The laptop and smartphone are connected. The connection is done either by a cable or by a wireless protocol such as Bluetooth. The laptop Software establishes contact with the smartphone App, and verifies by exchange of appropriate signals that the Software versions are compatible and in sync. 12) As in DCS, the Software authenticates the App by verifying the signed message. It does so by independently calculating the App’s new Public Key (PnC) using the formula in (10) and then performing a standard ECDSA check between Sig-VnC <Mn> and PnC. 13) Having established the App’s credentials, the Software now sends a request to the App for the ‘old’ message Mo that was securely stored exclusively on the smartphone during the previous Encryption phase. For added security, the App signs Mo with its new generation of the private key, and sends the signed message back to the Software: Sig-VnC <Mo>. The Software can verify the signature, and retrieve Mo in the usual way. 14) The message Mo is associated with the laptop’s and smartphone’s previous generation of public/private key pairs — i.e. the keys that were generated in the previous encryption cycle. The laptop is able to now recalculate those keys and hence also recalculate the secret S and the Encryption key. 15) The recalculated encryption key is used to decrypt the disk, and the User may now operate the laptop as usual. The newly created Message Mn is retained in memory for the duration of the session, which will end with an encryption phase when the user logs off, restarts, or shuts down (etc.). In some scenarios it may not be necessary or feasible to embed the serial number into the encryption key — for example, where the PED is a device type that does not have an accessible serial number. In such cases, the secret Sn itself can be used as the encryption key. A variation is the encryption of individual files or folders. The PED and Keyring applications can be designed to prompt the user for which files/folders to encrypt. For each individual file/folder, a new salt (Message Mn) will be generated from which a file/folder-specific encryption key will be derived. In such a case, the Keyring application will securely store a table linking the unique file/folder ID to the associated Message. As for disk encryption, the encryption key is valid for only one cycle — as a new encryption key is calculated for every new cycle (i.e. the relevant stored message Mn is replaced on the table after each session in which the file/folder has been accessed). The choice of message is arbitrary for the purposes of generating the encryption key, but needs to be new for each cycle. The message is reduced to 160 bits by hashing in order to keep the message length short. Nerdy info, but detailed for a reason – tech is on the rise and ‘security’ is paramount and in everyone’s interest. Amen.